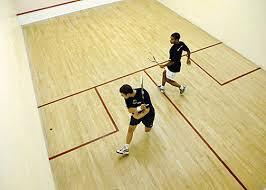 Welcome to The Cheshire County Sports Club and thank you for your interest in our facilities. We pride ourselves in being the ‘home-ground’ of a multitude of sports and activities and as such, we have a variety of facilities to offer you. We have 3G pitches for Football, Synthetic Pitches for Football/Hockey, Grass Pitches for Football/Archery/American Football/ Rugby and Cricket, Indoor Facilities such as the Sports Hall, and Squash Courts. Don’t forget we also offer a Fitness Suite, Group Fitness Classes and Fitness Memberships at The Cheshire. Our team of dedicated staff are available to help you choose the right facility for your activity or event, help make your booking an enjoyable one or guide you to the right contact in one of our many home based teams. Don't forget, after your game/booking our County Lounge bar is open for that well earned refreshment and at weekends our fabulous Clubhouse Café/Bar is open serving hot drinks, food, snacks and bar drinks too. We are delighted to have now opened our first 3G pitches at The Cheshire County Sports Club. These pitches are proving to be very popular and have outstanding value for money with the very affordable prices on offer. The 3G pitches can accommodate most sports and have mini soccer, 9v9 and 11v11 football markings and posts on them. Block bookings and casual bookings are welcome. Our 3G pitches are home to local football teams such as Newton Athletic, Chester FC, AFC Tarvin, Waverton JFC and many more. The 3G pitch also is home to the training base for Chester Romans too. We have the best, fully maintained, full sized synthetic pitches in the area. 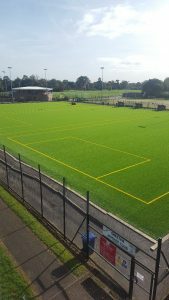 We take pride in the fact that our pitches can cater for football, hockey, handball, tennis, bubble football, and anything else you can think of that requires a synthetic surface that is fully enclosed in a safe environment with plenty of parking and changing facilities. 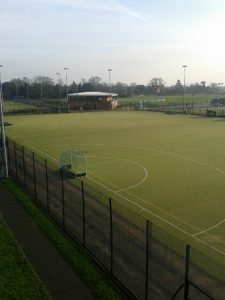 We offer 4 x 7 a-side pitches and 3 x 6 a-side pitches for football, along with 2 x full size hockey pitches, 4 x adult hockey pitches and 3 x junior hockey pitches. If you are looking to host a large tournament or event here the main hockey pitch even has its own spectator seating areas! 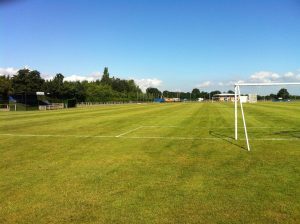 At The Cheshire we have 7 grass football pitches, ranging in size from 11 a-side to 9v9 and mini-soccer, from a weekly standard pitch to the county standard West Cheshire pitch that has its own stand and is self-contained. Our grass pitches are home to Football, American Football, Rugby League, Cricket (fully maintained cricket square) and Archery and come with access to indoor changing facilities (including separate changing facilities for the officials too). Tired or hungry after your game then you can always make use of our Clubhouse or Main Bar for a snack, team food or thirst quenching drink as our Social team can provide anything from Chips@TheCheshire to a full buffet or team food menu at affordable prices. 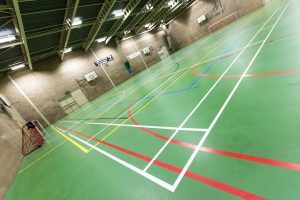 Located in our main building the sports hall is our jewel, this truly multi-use facility is able to host many sports ranging from Football, Badminton, Table Tennis, Basketball & Netball (full length courts), Archery, Volleyball etc and has 2 indoor cricket lane nets also. This hall is also used for large events such as antique fairs, table-top sales and corporate events as well as a variety of full day/weekend tournaments for local, county and even national and international competitions. We have 2 x squash courts with viewing areas and besides hosting our home-team squash fixtures, they can be hired out at very competitive prices for casual squash, racketball or other similar activities.